Remember. Serve. Celebrate. 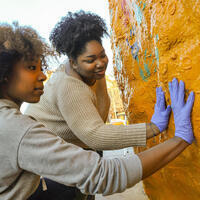 United at the Rock is a time for the University of Tennessee Knoxville community to come together to Remember who we are and where we have been as an institution, to Serve because it is the Volunteer spirit, and to Celebrate the unity that makes us a community. The events incorporated will center around unification in spirit and in service. Additionally, at 3pm we will begin painting the Rock with multi-color handprints to show our unity and at 4pm, we will have opening remarks. Families and community members welcome! The event is organized by Leadership Studies, Center for Leadership and Service, Faculty Senate, Campus Ministers Council, and Student Government Association with support from Athletics, the Vice Chancellor for Diversity and Engagement, and the School of Music. In 2018, the University of Tennessee, Knoxville was rocked by multiple expressions of violence and anti-semitic, racist hate on The Rock that do not reflect our values or our community. United at the Rock is a time to remember who we are as a Volunteer family. That shared identity calls us to serve our community as Volunteers. We’ll then look forward to celebrating how we have lived our values when we gather as a community for dinner and discussion at the United at the Table in September.